OK, enough with all the Corvette diecast models. I love Corvettes, but everyone likes seeing something new, and different. So Hello SRT Viper! For 2013 the snake returns as the muscle atop Chrysler Corp.’s various makes and models, and none too soon. Viper was a hot commodity for Dodge when it launched back in 1991. But as Chrysler transitioned from being owned by Mercedes-Benz to bankruptcy to Fiat ownership, the high-profile Viper was put on hiatus. Saab should be so lucky! But Viper is back, looking like a slightly more streamlined version of its muscular self. And from a model car collector’s perspective, it’s really about the outward appearance, if you’re buying something to put on your shelf or in a case. 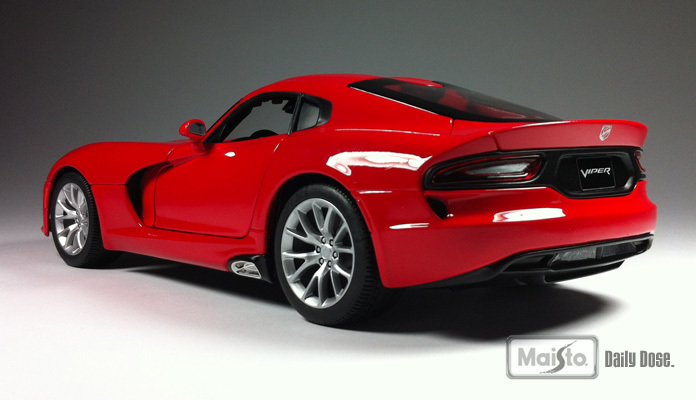 I’m sure the fancier, more detail oriented diecast car makers will be all over the new SRT Viper shortly, but we’ve got to give Maisto all the credit for delivering the new Viper first, and in two scales, 1:24 (the popular plastic model scale) and 1:18 (the more detailed diecast scale). Maisto’s Special Edition diecast models are moderately detailed, but bargain priced, being available in both mass market stores and hobby shops around the world. I like both models because they have good shelf appeal. Plus being available in black and red gives collectors some options. Sitting the two models side by side it’s obvious the 1:24 is more the toy, and for younger collectors, while the 1:18 offers more detail. We received both the red and black models to compare and found the red a much snappier looker, plus in 1:18 scale both the hood and hatch open. In the smaller scale, the hatch is sealed. Doors open on both sizes and the cockpit really is quite good in each model. Black looks great on the Viper too. Gauges are well detailed with appropriate trim and the steering wheel in the larger model is linked to the front wheels so they turn with the wheel. On the smaller car, the front wheels are fixed. I particularly like the look of the dash through the windshield on the 1:18 Special Edition model as you can see the dash texturing, the scalloped area mid-dash and the main center air vents.Seats look realistic and well contoured to reflect the car’s racy nature and the center console includes a well detailed shifter and hand brake.But as mentioned earlier, it’s the exterior that draws anyone to the Viper and the 1:18 model is well shaped and executed for its below $40 price tag. The paint jobs look thick and glossy, while on the red 1:24 scale there was a blemish on the car’s rear quarter panel next to the rear window. As a toy that’s not a big problem. Collectors will be happier with the 1:18 model. Doors and hood fit well as does the rear hatch. Displayed on a shelf, this looks darned near as good as some models costing three times more. The rear lights also look accurate and the front lights are good with a projector beam visible. Fit around the headlights is decent on the1:18 scale, but a little rough on the 1:24 model. Windows, wheels and hood duct work look accurate too, while under the hood you’ll see why this is a value-priced model. 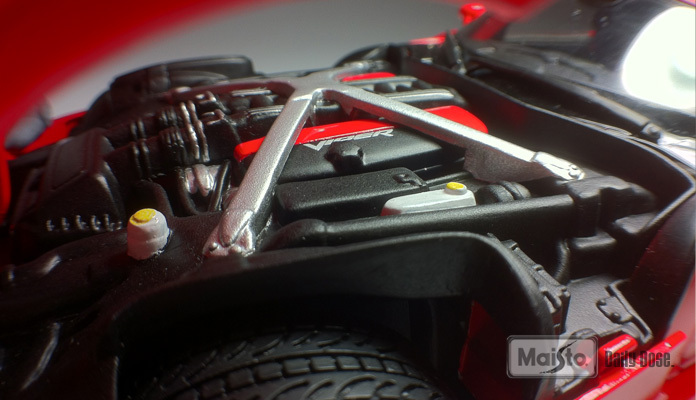 The engine bay on the 1:18 model is nothing flashy, but you’ll likely leave the hood closed for display anyway. The giant red-headed V10 engine is a separate piece in the larger model, but detailing is mild and looks very much like plastic. For instance, the cross members under the hood are molded into the other underhood pieces, but painted silver to make them stand out. Yet if you’re like many of us who display our diecast models mostly with the hoods down, this Maisto 1:18 scale model is a great bargain. I have a few other Maisto models in 1:18 in my collection and no one has ever said “boo” about them not looking authentic or detailed enough. 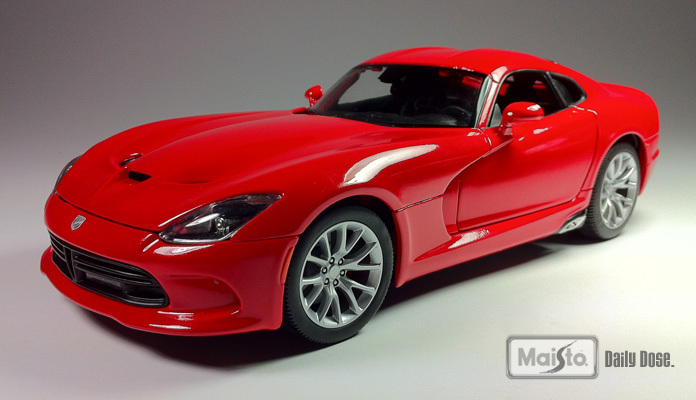 So if you need a new Viper to fill out your collection, the 1:18 version is the way to go. Leave the 1:24 for the kids to play with, it may start them down the road to collecting too. OR, they could just have fun playing. Remember that?